Most of today’s cold wallets are storage oriented and PC connected, providing little convenience while the risks still exist. Cryptocurrency owners are seeking the ideal secure wallet in the market. For them, the ideal wallet would be a secure daily trading tool that is mobile-oriented, full functioned and multi-currency compatible. Security, functionality, and usability are important features that define the next generation cold wallets. 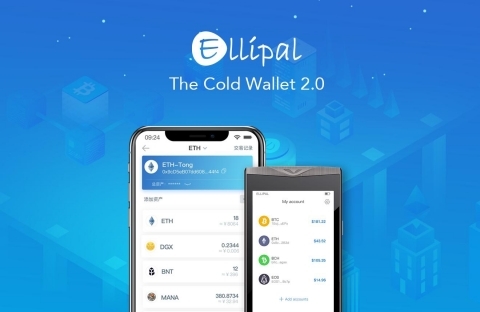 A group of talented blockchain experts from Hong Kong has officially launched ELLIPAL - a new wallet that ticks all the boxes above. It’s a mobile-oriented, full functioned cold wallet that supports trading. This is the start of the next generation cold wallet. The Cold Wallet 2.0 will become the essential tool for all cryptocurrency traders. The name ELLIPAL comes from ‘Elli’- Elliptic Curve Algorithm (the core technology of today’s cryptocurrencies) and ‘Pal’- partner. ELLIPAL provides users with a one-stop mobile digital asset management service. ELLIPAL is dedicated to connect every user to the blockchain. An independent piece of hardware to ensure the safety of cryptocurrency. ELLIPAL is a cold wallet. It’s isolated from any Internet connection such as 4G, WiFi, Bluetooth and USB. The only way to exchange information between the wallet and the ELLIPAL mobile App is through QR codes. ELLIPAL App provides all the functions that users need. In the App, users can look up market quotes and read news, make exchanges and payments, and connect with other DApps. Currently ELLIPAL is in cooperation with decentralized exchange protocols including LRC. ELLIPAL has created an universal OCCW (Open Cross Chain Wallet) protocol which allows our wallets to support multi-chain account systems and be multi-cryptocurrency ready. We believe this protocol will enable more devices to become multi-functional wallets, thus makes Blockchains more accessible to average users. Ready for the future of business world. Today’s cryptocurrency ecosystem is proliferating fast. Multi-currency is the norm of the future. ELLIPAL’s wallet solution just make the exchange between customers and merchants easy and transparent, we definitely bring them true value.